Methyl alcohol refers to a Monohydric alcohols. This is one of the most dangerous poisons for humans, poisoning which can lead to death. It is contained in poor-quality alcohol. Methyl alcohol is a colorless, highly mobile liquid, which smell and taste like alcohol. It is able to dissolve in many organic solvents: benzene, esters, and water. Methyl alcohol boils at a temperature 64оС. For the various mixtures in which it is part, that value may be slightly different. For the first time, methyl alcohol was obtained by J. Dumas and E. Peligo using the products of processing dry wood. It happened in the late 19th century. In 1923 he began to synthesize on an industrial scale. From the chemical point of view, methyl alcohol refers to a Monohydric alcohol, which has the properties of weak acids and bases. He is able to react with water vapor in the presence of a catalyst (the reaction takes place in smaller systems). As a result of such interaction is obtained a mixture of hydrogen and carbon dioxide. If you clear the mixture from carbon dioxide, you can get 98% hydrogen. When interacting with active metals (sodium, potassium and others) are methylate, and acid - esters. Methyl alcohol is a strong poison for the body. Even small doses (about 5-10 ml) is enough to permanently lose his sight. In mild poisoning severe headache and nausea. The person gets tired very quickly and becomes irritable. The poisoning of moderate severity patients concerned about frequent dizziness, vomiting and headaches. Methyl alcohol affects the Central nervous system and in 2-6 days causing a partial or complete loss of vision. In severe poisoning observed all of the above symptoms, which are quite quickly escalate into a coma. Blood pressure lowers, pupils dilate, and breathing becomes shallow. 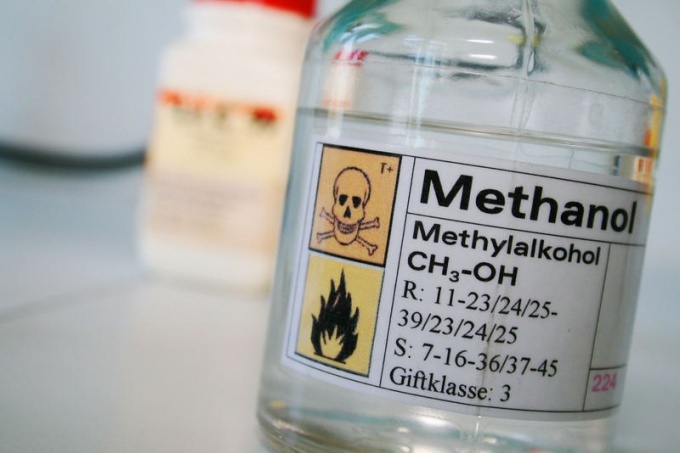 After severe poisoning with methyl alcohol to survive three people out of four. They remain disabled for life. Methyl alcohol is used in industry for the manufacture of many organic chemicals: acetic acid, methyl chloride cocktails, methylamines, and also some medicines. This alcohol has a high octane rating that allows you to use it as an additive to gasoline in order to save raw materials. Actively developed the technology of receipt from him of the other alcohols, in particular ethyl.